Mighty Ed. Image from Klukva Miniatures’ online store. 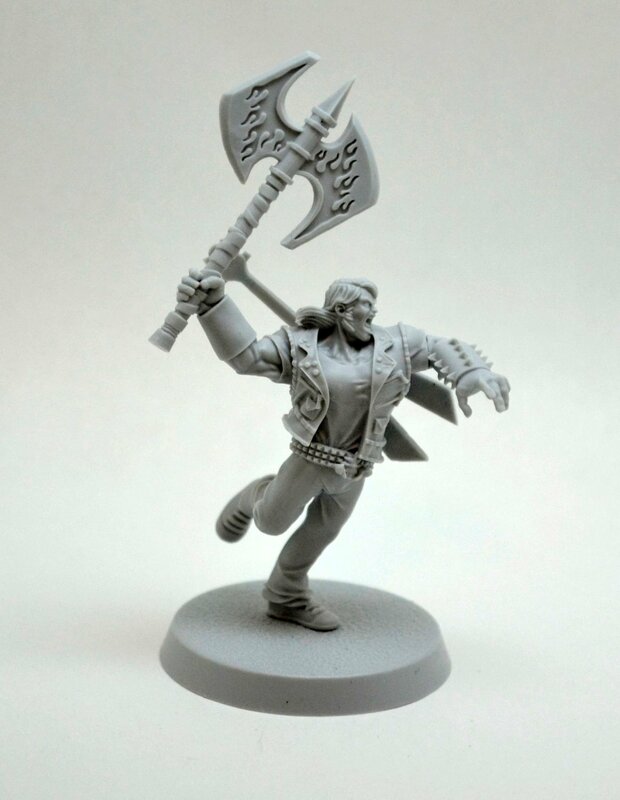 Most of you have already realized this miniature is a homage to Eddie Riggs, the main character from the videogame Brütal Legend. I’ve left this miniature as it’s shown because I like it like that, but Guillem had other plas in mind. He wanted to use this one as a brute (hence the pun in this post’s title) for his Ganger band for Punkapocalyptic. Also, as he wanted to equip this miniature with various weaponry options, he asked me to magnetize a removable shield, and also to be able to switch between the axe and the guitar as his weapons. Sadly, my magnets were not small enough to fit on the pieces I had to magnetize, so I got creative. For the shield he gave me, I had to etch a score between two rows of spikes where I embebed a thin steel wire. Once done, I covered the score with a really thin layer of greenstuff to make sure that the magnet would still stay put. Then I just made a little seating for the magnet on the shield, as those spikes wouldn’t let me stick it with magnets otherwise. Then I took the hard road for the axe/guitar. Whereas anybody else would just put a pair of magnets on the hand and arm of this miniature, and then model another hand holding the guitar to do the same, I chose to hollow out the clutching hand enough for it to fit two of my magnets. After that, I split in half both the axe’s ant the guitar’s masts, and then I sticked a flattened steel wire, then for last I modelled what had to be redone with some greenstuff. My reason for this approach instead of the logical one was that, being that both the axe and the guitar gravity center was too far upward, it would rotate as soon as the miniature was moved through the battlefield, and my partner didn’t want that to happen during games. Next time I will just pin both the real and the modelled had so it can be easily swapable. I hope you all enjoyed this. Next week I’ll show you another simple conversion for my Aleph army for Infinity. Don’t miss it!